When you plan a holiday months in advance like me, you never know if mother nature is going to be on your side or not. However, if you're heading to Asia in August when its either monsoon season or just hot, humid or rainy, your luck gear switches from hopeful to better luck next time. It's something we should have prepared for but due to how the academic calendar works in the UK, we have no choice but to travel in August. An Umbrella - Key part of your packing list if you're going to Asia in August. Being able to pose with one is optional. Now we didn't have it so bad in Korea. The sun was shining during our whole trip in Jeju-do, Busan was cool in the evening but dry when we went to the beach and even when it was spitting in Sokcho, it was more of a silver lining for a hike. It was in China that we saw the cold shoulder of mother nature. Hangzhou was our first stop for China. A city located in eastern China, it is the largest in the Zhejiang province and only an hour away from Shanghai by train. The number one reason tourists flock to Hangzhou is to see the beautiful West Lake, which is also a UNESO heritage site. The fresh water lake is scattered with tombs, pagodas as well as gardens and its scenic both at day and night. 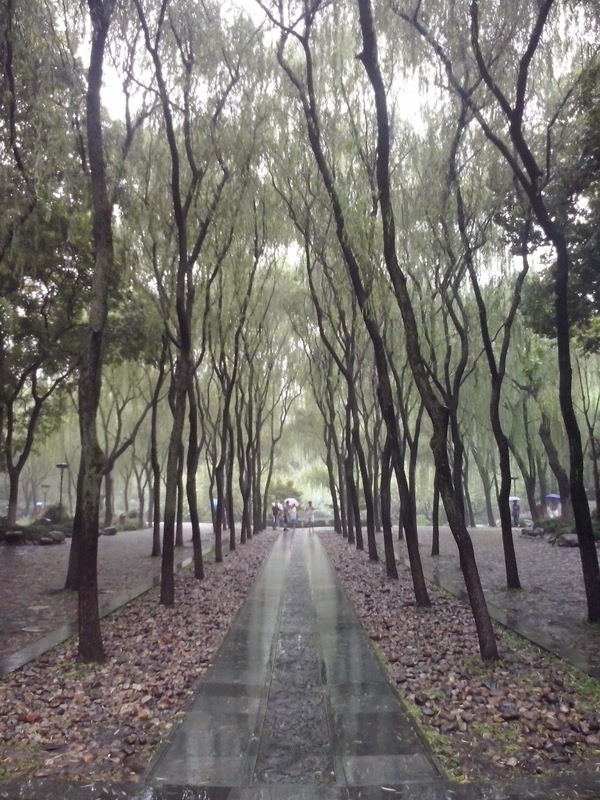 There are other attractions in Hangzhou such as the Long Jing tea farm but we came exclusively for the West Lake because quite a few people had recommended us to go there. 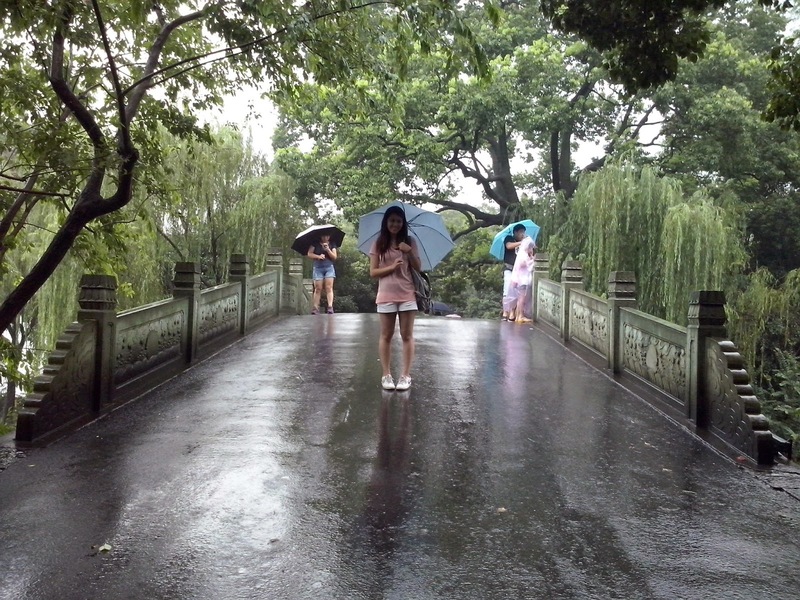 The West Lake also has dedicated "scenic spots" and each of these are named by a four character "epithet" such as "Remnant Snow on the Bridge in Winter" and "Three Ponds Mirroring the Moon" (can see you see where the inspiration of the blog title came?). Some may say these names are beautiful... others might not take them so seriously but what I can say is that there is a "medal" station at each of these spots so that you can reward yourselves and prove to people who did not doubt you in the first place. Tourism taken too far but I would lie if I didn't admit they made tempting souvenirs. However, we had a slight hitch in our plans. It was pouring down as if the clouds were in their terrible twos and decided to throw a stubborn tantrum. Seeing that the weather turned to blissful sunshine on the day we were leaving... maybe it was throwing a tantrum about us? Now the rain is nothing to us Brits! Me and Elaine marched out with our English Pride determined to see the West Lakes. We're here for two days and we weren't going to give in and spend it in a hotel room! First thing's first, we needed an umbrella. Luckily we found one for 20 RMB (£2), but as the price suggests, they didn't have enough strength to return with us to the UK. Second thing, I needed to leave back my camera, no way was a risking a new camera for the rain (hence the poor photo quality, sorry!). Third thing, we set off. I'll admit, the first twenty minutes or so wasn't very enjoyable. Between trying to figure out were the damn Su-Di was and if we should prioritise finding the ten scenic spots as opposed to leisurely walking around, we were getting very soaked. Elaine's shoes couldn't bear the moisture and had to be thrown away due to the mould a few days later. My walking sandals survived but with a strong stench that Rae couldn't deal with. 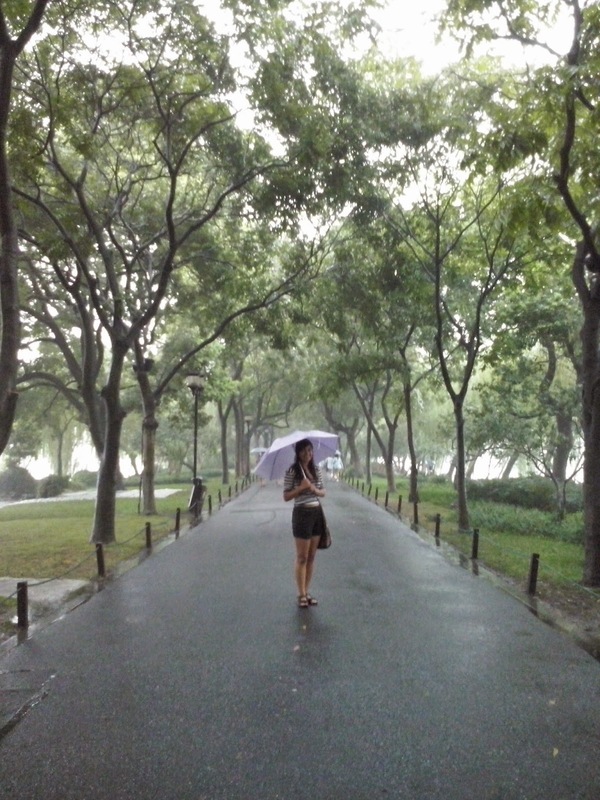 Was a drenched walk around the West Lake really worth it? The strong detest in a wasted day kicked in and we finally reached the point that we liked walked down the Su Causeway. Elaine will always look lovely in photos, whatever the weather, location or the situation with her shoes! 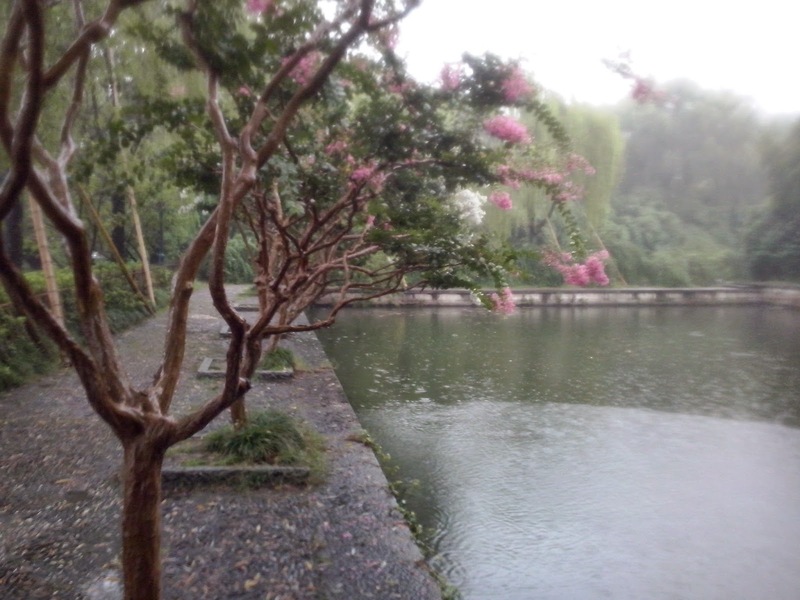 The West Lake is beautiful but the weather didn't help but make it look a little dull. 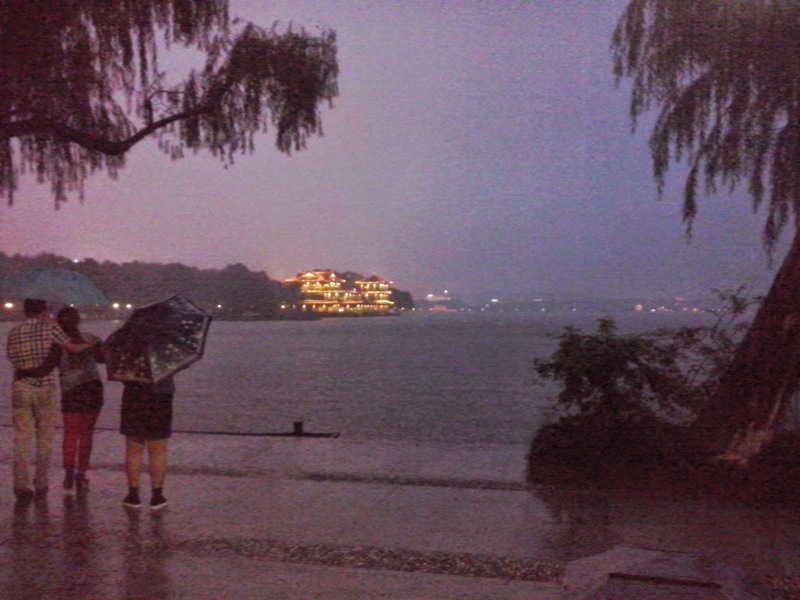 I enjoyed walking on the causeway and I enjoyed it more at night with the lamps illuminating the pathway, the temples light up and us playing a little with of KPop out loud (like the hooligans on the back row in the London buses but adults were doing it everywhere in China). It distracted us from the most painful mosquito bites I have ever received (beware in Hangzhou) and the worst food I've eaten in my life (red sauce eggplant and "stuffed" beancurd which ended up being sick sauce and greased crisps). However, the highlight of our trip was definitely the hostel we stayed at. South Korea maybe be new to the whole backpacking scene and the hostels we stayed at ranged between pleasant to the worst thing I have ever slept in. So when we first arrived in Touran Hostel, I wasn't expecting a cosy yet quirky decor or atmosphere that Korea made e forget the hostels had. Our room? AMAZING (compared to what we had in the last two weeks), the staff were friendly and the breakfast was the best we had yet. The hostel also hosted movie nights every evening, a chance for us to watch something really bad... but it was always a good way to break the ice with new people. If you stay in Hangzhou, I definitely recommend Hangzhou Touran Backpack Hostel. The Chinese version of "James, Nuzhat & Elaine".